Version 1.31 is out! Users will have seen an update notice on their server login screens and can request an upgrade (for free, as always) by contacting support. As with all other updates, this one involves stability and reliability improvements, but we are particularly excited about two major features we added to this release. Users could already sync data offline by physically plugging devices into their computers – but that was a cumbersome process, especially if one had a large survey team with lots of devices. We wanted offline syncing to be more seamless. And we wanted the offline sync user experience to mimic that of downloading and uploading data from the server: local computers and Android devices connecting to each other wirelessly, so that surveyors could send finalized forms and get new blank forms on their devices just as they would when connected to the server via the Internet. And now you can do just that! All you need is a device that can create a local wi-fi hotspot without requiring an Internet connection (a router, PCs running Windows 7 and later, certain Android devices). To sync, just connect your computer (running the SurveyCTO Client software) and your Android devices (running SurveyCTO Collect) to the local wi-fi network created by that device. Once you do that, your computer will act as the “server” and you can download blank forms on to devices or upload data from devices just as you would if the device were connected to the Internet. 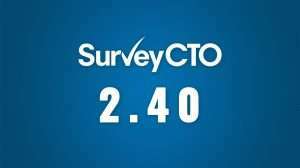 All uploaded data from the different devices gets sent to the computer and automatically aggregated by the SurveyCTO Client (so you can easily export all your raw data as a single .csv or Excel file). Since devices can connect to the computer simultaneously via the local wi-fi network, you don’t have to worry about syncing devices one by one. You can even connect different computers to each other and transfer data between them, so the workflow possibilities are endless. Connect your devices to different computers and connect computers to each other in any configuration you prefer. We’ve even designed the SurveyCTO Client to automatically handle duplicates so you don’t need to worry about messy data if you are sending data back and forth in a complex set up. You will always have a nice, clean set of submissions on each computer; the Client will do all the dirty work for you. 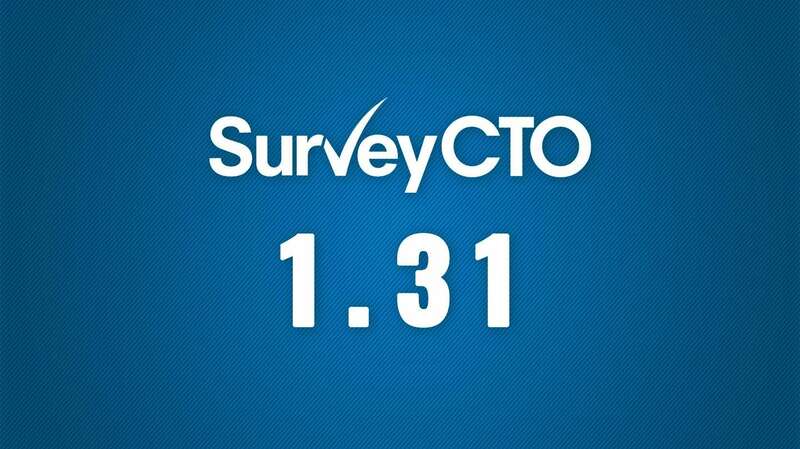 Over the last few months we’ve also been working hard to make it easy to integrate the SurveyCTO server with external systems, so that users have more flexibility in how and where they view and analyze their data. We had already added the ability to easily sync data on your server with Google Spreadsheets or Google Fusion Tables – to allow users to monitor data and create charts, maps and visualizations that automatically update in real time as data is uploaded. The folks at openfn.org are also finalizing a SurveyCTO-SalesForce integration that will allow for easy syncing of data with the Force.com platform. Now, with v1.31, we have also added a REST API to allow programmatic access to server data. More technical users (or those with technical assistance) can automate the pulling of .csv data from the server and the publishing of it in external systems. These external systems could be relational databases with patient records that you want to automatically update with data from the server. 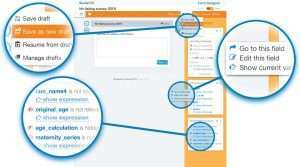 Or they could be websites with visualizations that change as new data comes in via SurveyCTO. Because of the flexibility the API allows, users can send the data anywhere they wish. Note: we haven’t included help documentation for the API in our regular help. If you are interested in using it, just submit a support request through our customer support page and ask for the documentation. There are other, smaller improvements too. For example, if you use Excel to review or edit your data, there are a few new options as well as a new help topic. You can always see the full list of changes in v1.31 (or any other release) by reviewing the release notes.